Chester suffered their eighth defeat of the season when they were beaten 2-1 at FC Halifax Town on Saturday. As at Gateshead, the Blues fell behind to an early goal with Lee Gregory scoring in four minutes. 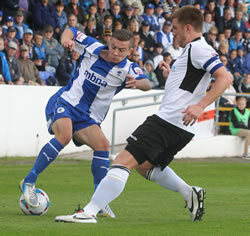 Chester responded well and created several chances before Gareth Seddon glanced home an equaliser in 18 minutes. 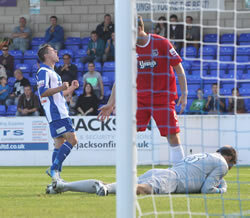 Matt Glennon in the home goal made a couple of good saves to deny Craig Lindfield as Chester finished the half well. Not for the first time this season through Chester were second best after the break in a game that turned scrappy with several yellow cards. The home side grabbed the winner in the 64th minute as Chester failed to clear a corner which was headed home by Marc Roberts. Following the match manager Neil Young said: “It’s very difficult to take a defeat like Saturday’s but I have to just dust myself down, build myself up, and try and put it right again for next weekend’s home game against Kidderminster. “I know as a manager that when things aren’t going well then it can be a very lonely place. I always analyse myself and I’m struggling to think what more I could have done or what I could have done better against Halifax. Manager Neil Young blamed individual errors for Tuesday night’s 3-2 league defeat at Gateshead. The reverse saw Chester drop a place to 22nd in the table, to add to their woes Kevin McIntyre picked up a straight red card in stoppage time. The Blues fell behind to a wonder strike by Carl Magnay after just 52 seconds. Despite the early setback Chester found their way into the game and equalised through Danny Harrison just before the half hour mark. Gateshead rocked Chester with two goals in two minutes shortly after the restart to grab the initiative, and despite a well taken goal from Danny Higginbotham, they wre unable to gran an equaliser. “It’s very frustrating to see us paying the price for commiting basic defensive errors. We gave a free kick away which I didn’t think was a free kick and then let one of their players walk off us. The players just didn’t do what they were told. I put diagrams on the board to show where everyone should stand at setpieces, but nobody has taken any notice. “We switched off from a free kick and that just about summed us up. I think the days of players taking more responsibility are over. Now it’s always the manager’s fault. Some individuals will have to look at themselves because some of them are making basic errors and they are costing us. Chester are back in action at FC Halifax Town on Saturday, kick-off 15.00hrs. Halifax, promoted with Chester last season, lie just above half-way with 17 points from their opening 11 matches. There will be a City Fans United meeting this Thursday 26 September in the Blues Bar starting at 19.30hrs. The meeting will give the club the chance to update fans with news from Deva Stadium, and will also give the opportunity for supporters to ask questions. New memberships, and membership renewals will be taken on the night. Chester will feel that Saturday’s goalless draw with Grimsby Town was a lost opportunity. Home fans would have probably settled for a point before the match, but not after The Mariners played the last 40 minutes with ten men after the sending-off of Joe Colbeck for hitting out at Lee Pugh following a challenge by the Blues defender. Chester had had the better of the opening period but lacked any real cutting edge in the final third, a problem that has troubled them all season. The red card seemed to spur Grimsby on with Chester reduced to just a decent effort from substitute Alex Titchiner that was well saved by James McKeown in the visitors goal, and an effort from Lewis Turner that was headed wide. The games are coming thick and fast, tomorrow night the Blues travel to Gateshead whose 1-0 win at Tamworth on Saturday lifted them two places to 17th, two points ahead of Chester. The Heed recently appointed former York City boss Gary Mills as their manager. Chester moved out of the bottom four in the table after a hard fought 2-1 Cheshire derby victory over Macclesfield Town on Tuesday night. First half goals from Aidan Chippendale, a direct free-kick, and Gareth Seddon gave Chester a two goal advantage their early play had merited. The Silkmen though reduced the arrears through Daniel Whitaker on the stroke of half time. It was backs to the walls after the interval with Chester having to withstand a lot of Macclesfield pressure, a Ben Mills penalty saved by Macc ‘keeper Rhys Taylor only added to the tension but Chester held firm for their first home win of the season. Chester welcome tenth placed Grimsby Town to Deva Stadium on Saturday, kick-off 15,00hrs. Following the match the club are holding a beer festival in the Blues bar with 14 real ales, plus Ciders on offer. Entry to the event is free. Chester suffered their sixth defeat in the opening eight matches after surrendering an early lead in Saturday's 3-1 defeat at Salisbury City. To make things worse the Blues had on-loan striker Shaquille McDonald dismissed for violent conduct, he has now received a three match ban. After a bright start by the visitors, Joe Heath (pictured), recalled to the side this week, headed Chester in front on 14 minutes following a Ben Mills lay-off from Danny Harrison’s free-kick. The home side responded and drew level on the half hour with Daniel Fitchett seeing a header deflect past John Danby. A series of fine saves from Danby ensured the score remained 1-1 at the interval. Chester made changes after the break bringing on Gareth Seddon and McDonald for Ben Mills and Alex Titchener but it was the home side who scored on the hour mark through the unmarked Elliott Frear to grab the lead. Lewis Turner blasted a great opportunity over the bar before from the time the game was over as Clovis Kamdjo headed home a third for the Whites five minutes from time. Both sides were reduced to ten men in the closing stages, Salisbury’s Angus MacDonald was dismissed for a tussle with Seddon who was yellow carded and Chester’s MCdonald was sent-off for lashing out at James Clarke. The defeat leaves Chester still in 21st place, next up is an important home Cheshire derby on Tuesday night with Macclesfield Town who lie next to bottom in the table having picked up three draws in their opening eight matches. Chester have signed forward Shaquille McDonald on a three month loan from Peterborough United. The 19-year-old player was formerly at Chasetown before signing a four year deal with Posh back in April. Chester and Dartford fought out a goalless draw on Saturday with both sides guilty of missing chances. With Marc Williams allowed to leave, manager Neil Young has expressed his desire to sign a goalscorer on loan. The Blues have netted just four goals in the opening seven matches this season with only one coming from a striker, Ben Mills against Forest Green Rovers. 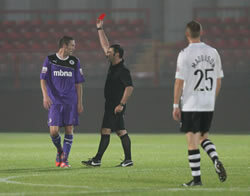 There was a dramatic end to the game with Gareth Seddon seeing a header that looked to have crossed the line four minutes from time being ruled out for offside, while the Darts thought they’d snatched the winner in stoppage time only for Danny Harris effort to also be ruled out with an offside flag. The first home point of the season lifted Chester up a place to 21st with the next match being away at Salisbury City on Saturday, kick-off 15.00hrs. After re-signing for the club in the summer, midfielder Marc Williams has been released from his contract at Chester and has joined Evo-Stik Division One North side Northwich Victoria, who are now based in Urmston, Manchester. Saturday is Non League Day and to mark the occasion Chester are offering free admission to all under 16’s, accompanied by an adult, for the home game against Dartford (kick-off 15.00hrs). The offer applies to all parts of the ground. Goals from captain Paul Linwood and Lewis Turner in the opening 17 minutes brought Chester victory at arch rivals Wrexham on Saturday and kick-started their season that had started with five straight defeats. Defender Danny Higginbotham made his debut for the Blues, replacing George Horan who started on the bench, Paul Linwood came in for Lee Pugh and goalkeeper John Danby was recalled after missing the home defeat against Forest Green Rovers. Chester got off to the perfect start after just four minutes with Linwood rising above Steve Tomassen to head home Jordan Laidler’s pinpoint free-kick past Joslain Mayebi in the home goal. Chester doubled their advantage on 17 minutes as Nathan Turner beat Evans on the left before cutting the ball back for brother Lewis to poke the ball home from ten yards. Wrexham applied some pressure for the rest of the half but it was 30 minutes before their first real effort as Bradley Reid saw a shot following a corner blocked by Linwood, to appeals for a handball from the home fans. The home side forced 14 corners during the 90 minutes but the Chester defence, boosted by the experienced Higginbotham, held firm. Seven minutes from time Ashley Williams was given a straight red card for raising his hands to Reid.